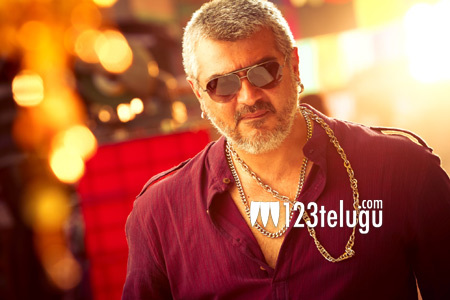 One of the most eagerly awaited movies of the upcoming Diwali season, Tamil star Thala Ajith’s Vedalam, will be dubbed into Telugu as Aavesham. As per the ongoing buzz, Aavesham will be released on the 10th of November along with its Tamil version. Currently, the film’s re-recording process is in full swing and the entire post-production work will be wrapped up very soon. Aavesham stars Shruti Haasan, ‘Jil’ villain Kabir Duhan Singh and Lakshmi Menon in important roles. A major part of the film’s shooting took place in Kolkata. Aavesham is directed by Siva of Gopichand’s Souryam fame and produced by senior producer AM Ratnam. Young musical sensation Anirudh Ravichander is the film’s music composer.